We offer a range of professional packing services to give you added peace of mind that your belongings are packed to the highest standard using all the correct packing materials to ensure that they are well protected and will be safe for their journey to your new home. Full home packing service – This service entails our own experienced packers visiting your home a day or two before your move day and packing all your belongings into boxes ready to be moved on the big day. From your kitchen crockery and pots and pans to your clothes and books. We will also pack your computers and electrical equipment and also all pictures. With all our packing services the boxes are marked so that we know what is in them and what room they come from, so we can place the boxes in the correct rooms at your new property, making it easier to find things as you need them. Part packing service – This is just our full packing service with flexibility to fit in with your requirements. We understand that sometimes there may be items you wish to pack yourself, whether its through personal choice or because you wish to have a good sort through your effects as you pack them. 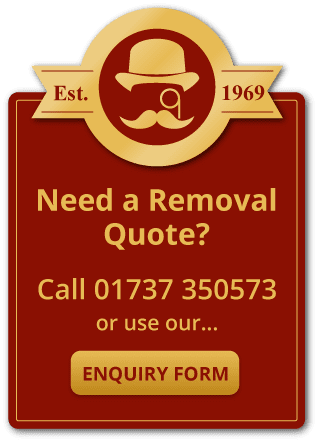 When we visit your home to do the survey you can tell us exactly what you do and do not want packed by us and we will work out a quote to suite your personal requirements. Breakables packing – This is when a customer would like to pack everything themselves but leave the delicate, breakable items to the experts. We will come to your home before the move and pack all of your china, glass and breakable items. This service also covers packing all of your pictures. Export wrap – Whether you are shipping your effects to a distant land or just have those extra precious belongings or antiques that need just that bit of extra special treatment, we can wrap them from top to bottom in our special furniguard export wrap that will completely protect your furniture while in transit. Our bubble blanket wrap is specially designed for all furniture to give maximum protection with a triple layer of special material which also allows the furniture to breath when wrapped avoiding any condensation on the inside which ordinary bubble wrap can cause. Unpacking – We generally leave the boxes in the rooms they are meant to be in and leave you to unpack them at your leisure, but we can offer an unpacking service which involves us unpacking your effects from the boxes in the required rooms and take away all of the packaging ready for you to place your belongings away in cupboards etc as you want it. The added benefit of having our experienced staff pack your belongings is that you will have full liability cover for the items inside the boxes for any breakages giving you that extra peace of mind! Our packing service is designed to make your moving experience just that bit easier and stress free with many customers coming back to us saying that is the best money they have spent in years! Just think living as you are now with no disruption to your everyday life with no living surrounded by boxes for weeks before your move and getting stressed with trying to pack a box here and there between your busy schedule. All you have to do is open the door to our packers the day before you move, put the kettle on and sit back and let them get on with it. You are then free to get on with your everyday life and organising the many other things that are involved with you move!